Eating disorders (ED) love shame and secrecy. The more we talk about them, the easier their treatment becomes. This more than anything drives international organizations working on EDs and body image disorders to drive campaigns to stem stigma and disinformation about these serious mental illnesses which cause the maximum numbers of deaths worldwide due to a mental disease. While the rest of the world is more than ready to face challenges posed by EDs, India perhaps is failing its women and children who form the single-largest category of sufferers. The image that pops into my mind when I think of an eating disorder is of a teenaged girl, emaciated beyond belief but refusing food, followed by a picture of a 40-year-old Indian woman, nicely- rounded and vomiting surreptitiously in the bathroom. Both these scenarios are true pictures of eating disorders, but, most of us don't know that an increasing number of middle-aged women are falling prey to EDs. And what’s more, most of us can’t name a single symptom of an ED … And we’re talking about a serious, progressive psychiatric illness here! This drove us to speak with three experts on ED- Kamna Chhibber, Clinical Psychologist and Head - Mental Health, Fortis Healthcare, Behnaaz Engineer, a certified life coach, and Naazendeh Mecklai, a nutritionist – to get the right picture about eating disorders and Indian women-what makes them so vulnerable to this mental disease and what can be done to help. Eating disorders may well have been named incorrectly as they are not about one’s relationship with food but are a psychiatrist illness which has a lot to do with one’s body image. In fact, the dysfunctional relationship that sufferers share with food is just a symptom. What’s insidious is the casual dismissal of a serious psychiatric illness like ED as ‘just dieting’ by both Indian women and their families. Most EDs like anorexia and bulimia typically and ironically start as dieting. And since dieting is considered good for young girls as it makes them thinner and more desirable, families accept and encourage their ‘disordered’ eating. “Young children develop ‘eating distress syndrome’ – and this gives birth to what we call, the ‘yo-yo’ eating habits gravitating between junk bingeing and starving, and later on, eventually culminating into major eating disorders,” explains Naazendeh. For the record, by no means is anorexia or any ED a diet gone wrong. EDs are an offshoot of body dysmorphic disorders (BDD) which are a serious psychiatric illness that makes a sufferer feel that she is hideously ugly. Studies have also found that a high proportion of individuals diagnosed with BDD also had some kind of eating disorder, with over 15 percent of them suffering from either anorexia or bulimia. The "Big Three EDs' are Anorexia Nervosa, bulimia nervosa and Binge eating disorders. These three are by no means the only EDs. 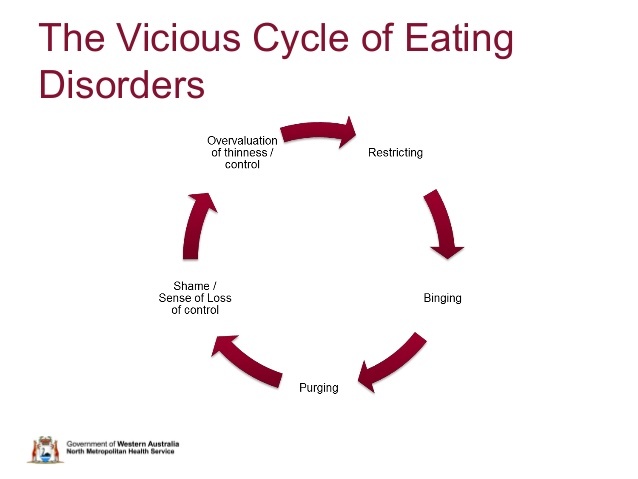 There are subclinical eating disorders like disordered eating and EDNOS or ‘eating disorders not otherwise specified’ that are by all means extremely toxic to the sufferer. Naazendeh adds that sometimes instead of getting their anorexic daughters to psychiatrists, parents bring them to nutritionists, hoping that this will help them attain ideal weight, which never really happens. “We have been referred to by gynaecologists when the periods stop due to EDs, “she adds. There is also an absence of an understanding of what triggers EDs. A large number of people still think EDs are a passing phase in a young girl’s life and have no idea that it’s a serious mental disease that can get progressively worse. This kind of myth-making is very dangerous mainly because it prevents sufferers from getting professional help for years and sometimes never at all. The statistics on eating disorders are downright scary. We can say with complete confidence that about 2 % of the global population is affected by ED. What’s even scarier is that experts point to a lack of ‘real’ data on EDs in India. NO generalized study has been done in the subcontinent to pin down the exact numbers –studies have only been done taking low sample size from for example schools in an urban setting and then extrapolating the results. These too, present an extremely grim picture. Disturbed eating attitudes and behaviours are present in 26.67 % of adolescent girls in India according to a recent groundbreaking study ‘Prevalence and risk factors for eating disorders in Indian adolescent females’ which studied the eating attitudes and behaviours of 120 adolescents females (age: 13-17 years) at one Indian independent school. Another study showed that girls who were already perceived as too thin continued to wish to be thinner and the level of body dissatisfaction was higher among girls of urban areas as compared to rural areas (Dixit et al. 2011). A survey amongst psychiatrists in Bangalore (Are eating disorders a significant clinical issue in urban India?) was conducted among 66 psychiatrists to find out whether eating disorder is a significant clinical issue in urban India and it concluded that two-thirds of psychiatrists reported seeing at least one case of ED indicating that EDs are common in urban India. And that’s very much all we have. Thus, epidemiological studies on ED are required to provide better estimates of its prevalence. Global statistics place adolescent girls at highest risk for developing eating disorders. But the pervasive culture of thinness affects all women and can lead to an ED anytime in one’s lifetime. -EDs cause more deaths than any other mental illness, including depression. -The annual mortality rate per 100,000 people from eating disorders in India has increased by 67.5% since 1990, an average of 2.9% a year. -ED comes with co-morbid conditions. Binge eating is associated with increased incidence of depression and personality disorders. - The prevalence of anxiety disorders is much higher in people with anorexia and bulimia nervosa. -ED, especially bulimia, is also extremely likely to be found with Bi-polar disorders. - Eating disorders are also associated with increased risk of substance abuse, with the risk being more for bulimia nervosa and binge eaters. -When young girls are supposed to be packing their bones with calcium and building up muscle with protein-rich food, they are actually losing bone mass due to EDs. This can lead to osteoporosis later on in life. -Anorexics are also more prone to heart failure and hormonal changes which can lead to an absence of menstruation, resulting in infertility. For families and caregivers, the message going out from our experts is that it’s important to realise that the sufferer does not want to inflict pain and suffering on their own selves and it's important to ensure that they are not overtly negative and use comments demonstrating hostility, criticalness and emotional over-involvement, and instead work closely with the treating professionals. If you are affected with an ED, seek help and sort it out at the earliest, instead of blaming yourself. “Do more physical exercise and spend more time doing stuff that makes you happy,” opines Naazendeh. Nutrition training that teaches women about healthy bodies is also critical for a treatment. Treating EDs in older women can be trickier. “In order to help older women overcome eating disorders, we must actually get to the root of the problem. And in my opinion, there are many who still seek treatments, which are not holistic. As an eating disorder is usually a manifestation of emotional or mental states that need to be acknowledged and healed, I personally believe that an ideal combination to overcome an acute eating disorder is when a nutritionist/specialist and a coach actually come together and work with the client inside out. That is when the client is truly empowered to be free of the emotional phantom chords that bind her to ED,” adds Behnaaz. Last but not the least, treating ED is not time bound. Just like happiness, or laughter or love…You’ve got to work at it every single day. Nothing or person can do it for you... You are the best Captain of your ship.